Team Tainan has had a busy Friday-Sunday on our final weekend of the project. On Friday afternoon, we presented findings and preliminary recommendations to the Tainan government. It was a positive and affirming experience for us, as even through translation, many of our positions were met with nods and other positive body language. We have work to do to refine our proposal in the week ahead, but we are on the right track. 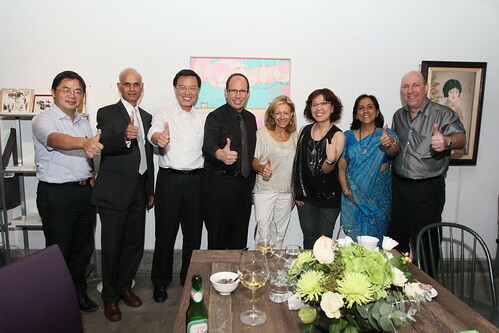 Friday evening, we attended a dinner party with Tainan Mayor Lai and his senior staff. The dress code was “shiny” which lead to some fashion choices we may want to forget…however the reception, held at renovated gallery BBArt, was quite fun. A few of us went to explore on Hai-An Road after the party. Saturday, we headed out with the tourism board and local guide Kevin to see some more of Tainan City. We started at the market on Hai-An Road, where for whatever reason, we were offered many treats for free. Lychee, Longan, roasted pork, taro cake, sticky rice, and more all headed our way “just to try.” Then we visited some of the nearby street food and tried yet more local specialities. Moving on, we visited a few temples, including two where parades were being held. The firecrackers announcing the parade were pretty loud! Our tour concluded at a traditional tea house, which was quite refreshing after the long walk in the hot sun. Saturday evening and Sunday were “on our own” days but it didn’t really turn out that way. In a city of nearly 2 million people, how random is it that Ed, Irv and Anjana, and Hari all met each other in the alleys near Confucius Temple?!?! Donna wasn’t far away, either. Irv, Anjana and Ed had lunch in a very small local place where we dined on various Thai fried rice and passion fruit juice…total for three people: NT $250, or US$8.33! Each of us had shopping agendas, with Donna and Ed returning to the recently-restored Hayashi department store for gift-buying. It was much busier on Sunday than it had been during the week; the staff was very helpful even with the crush of people, and it was one place where we seemed to reliably be able to speak English. This Monday morning, it’s back to work – our recommendation report and presentation must be completed before meeting Mayor Lai again on Friday. Let’s not forget the relaxing massage I had and the facial for Donna at the hotel. Donna and I had dinner at the restaurant on the 38th floor and could see fireworks in different areas of the city.